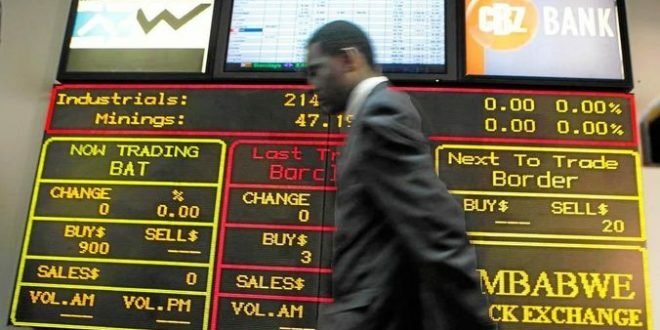 TURNOVER on the Zimbabwe Stock Exchange (ZSE) dropped 22,37% to $118,03 million in November from $152,05 million in October as lower volumes were traded on the local bourse. The total volume of shares that were traded dropped 51,33% to 153,88 million shares from an October high of 316,19 million shares. Market capitalisation dropped 4,08% to $17,40 billion from $18,14 billion in October. Market watchers say during October, investors were seeking cover against any potential losses from the growing disparity between the greenback and local money by increasing their trades on the main bourse. “As government interventions increased and engagements with the private sector a decrease in the inflationary pressures was observed last month resulting in investors easing off speculative trading”. The All Share Index declined 2,09% to 160,40 points while the Top 10 index lost 1,49% to 164,98 points. Top gainers during the month were Rainbow Tourism Group 37,93%, First Mutual Properties 25,57%, NMB Bank 20%, ZB Financial Holdings 19,34% and Delta 13,50%. African Sun and First Mutual Holdings were on the down side dropping 32.20% and 24.41% respectively. Hippo was down 23,88%, as well as Meikles which shed 23.19% and Edgars which declined by 20%. The industrial index for the month of November was down 2,03% to 538,66 points, weighed down by a 12,42% loss in Econet shares due to its proposed unbundling of over 30% of its business. The mining index fell 4,04% to 208,56 points weighed down by losses in RioZim and Bindura. Towards the end of October, RioZim suspended operations at its Cam and Motor Mine, Dalny Mine and Renco Mine after running out of consumables and spare parts owing to forex challenges which affected operations. As a result, the mining company sued the Reserve Bank of Zimbabwe for $92 million it claims it is owed dating back to 2016. In the case of Bindura, the nickel miner was weighed down by low production and logistical challenges in moving product out of the country. Currently, stock brokers are seeing potential gains in the retail counters in the short term as consumer spending is expected to firm up following Treasury’s timely payment of bonuses for civil servants this year.